With 11' of cargo space on the XLR Thunderbolt 340AMP toy hauler fifth wheel, you can go just about anywhere and take along just about any off-road toy. 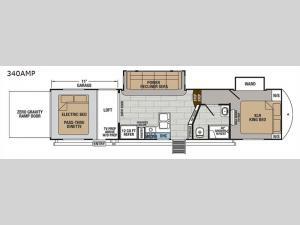 This Forest River model features double slide outs, dual entry doors, a loft, king size bed, and plenty of space to enjoy your time away from home. The power recliner sofa can be used for regular seating during the day or transform it into an extra sleeping space at night. You can enjoy a cool breeze from outside without getting eaten up by pesky mosquitoes thanks to the patio door. 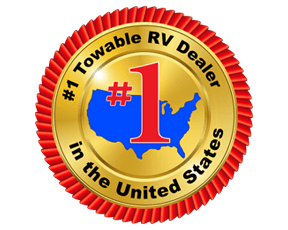 In any Forest River XLR Thunderbolt toy hauler, you will experience a fun-packed fifth wheel big enough to haul your toys, but still decked out on the features! Starting with it's 102" wide body construction, zero gravity loading ramp, a key alike system, and a MORryde CRE suspension system. 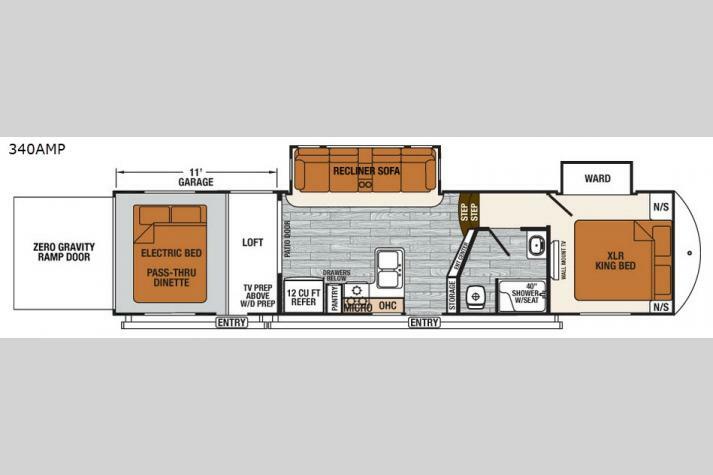 The interior is also packed with awesome features such as stainless steel appliances, a large LCD TV, prep for a washer and dryer, the Beauflor® tile pattern flooring, and an insulated garage floor.